We fished out of Spring Canyon. I had 4 rods setup with planer boards and one downrigger rod. I caught several fish on the downrigger set between 10-14ft. I ran 3/8oz lead on the planer boards to keep the gear In the strike zone. I use Rocky Mountain Tackle in pink and purple moonshine dodgers and pink and orange squids. We had 20 rainbows to the boat keeping 5. We also landed one 17” Kokanee. The weather was cold. Overall a good day but the fish are starting to move. This means you will have to cover some water to locate them. 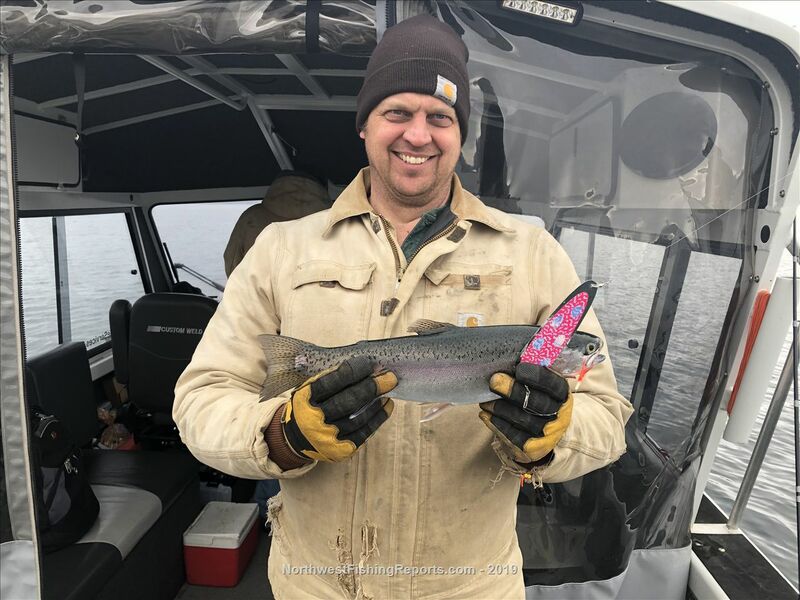 Washington Guide Services fishes Eastern Washington for Spring Chinook, Summer Chinook, Fall Chinook, Kokanee, Rainbow Trout, Cutthroat Trout, Walleye, Bass, Northernpike, Perch. View other reports from WashingtonGS. Got a trip in on the last day it's open and even managed to boat a kokanee! Thanks for your report. The San Poil Arm above boundary "A" at the mouth is open June 1 - Jan 31 (see pg 70 of current regs pamphlet). Are the limits sizes etc different Feb 1- May 31? The San Poil arm ABOVE boundary "A" buoys is CLOSED Feb 1 - May 31. Just wanted to comment on the Koke's, I haven't been out for over a year. Lost my fishing buddy to cancer last year! He taught me how to fish the Koke's and got me hooked. I just wanted to toss this out, when Papa and I went out this time of year and up to about May, we found the Silver's in very shallow water. We ran the shoreline and caught many of our Silver's in less the 12' of water. If anyone goes out looking for them try it and I'll see your post here to know if you had any success. The Swawilla and up near the Dam on the Spring Canyon side of the river toward Eden Harbor along the sandy shore below the Houses, we would troll very close to shoreline with planer boards and usually had some success. 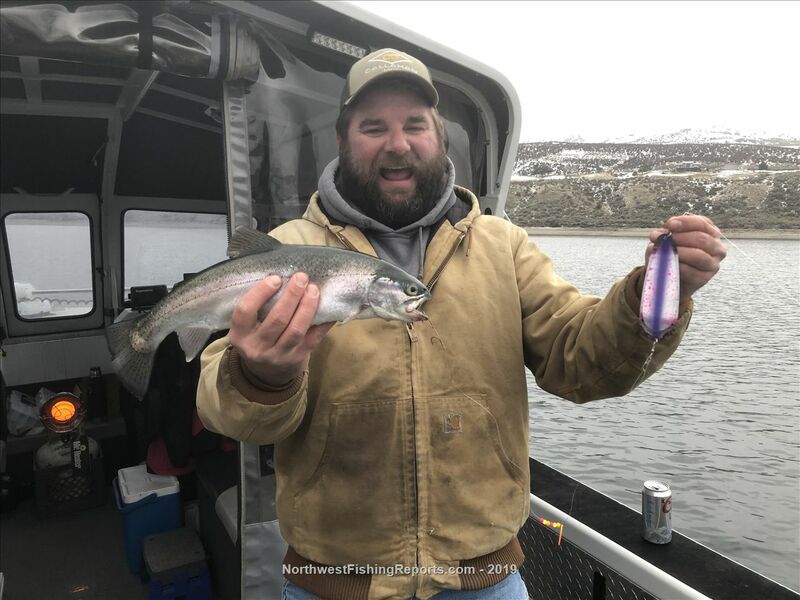 On one occasion there was a guide boat out by the buoy fishing deep water, he came over when he saw us pull a couple silvers in and said he wasn't having any luck. We told him they were laying up on the shoreline. So just thought I'd throw this out there since I can't get out anymore...I miss my fishing buddy...RIP Papa!